Predator meeting prey is part of the circle of life in nature. All living organisms need nutrition to produce the energy required to run their systems. Sometimes that predator-prey relationship is extremely clear, such as when you travel to Africa and witness a lion taking down a wildebeest, or when you tour Yellowstone and catch sight of a wolf pack tracking and catching an elk. At other times, however, the balance between predator and prey gets a bit jumbled. In the video below, a young red-tailed hawk and a four-foot bull snake seem to get themselves into a stalemate. That’s when two men happened upon the scene and subsequently tried to “untangle” the situation. Bull snakes are nonvenomous constrictors that can be found in pine barrens and sandy, open country. While they mainly eat rodents, they also prey on birds and lizards. Red-tailed hawks mostly hunt mammals—such as voles, mice, wood rats, ground squirrels, rabbits, snowshoe hares and jackrabbits. But they will also eat birds, carrion and snakes—even ones weighing more than five pounds. No matter how you feel about humans interfering in predator-prey encounters, the video does demonstrate the dangers that both face every day in order to eat. At least for this one day, both snake and hawk lived to search for dinner elsewhere—and find easier fare, we hope, on many days yet to come. I came upon this same situation in MN when I was 15. But the snake had one leg of the hawk down its throat up to its hip. The Hawk had pecked the snakes eyes out. It was clear if something was not done a coyote would make a quick snack of both. We killed the snake and the hawk reached much the same way. 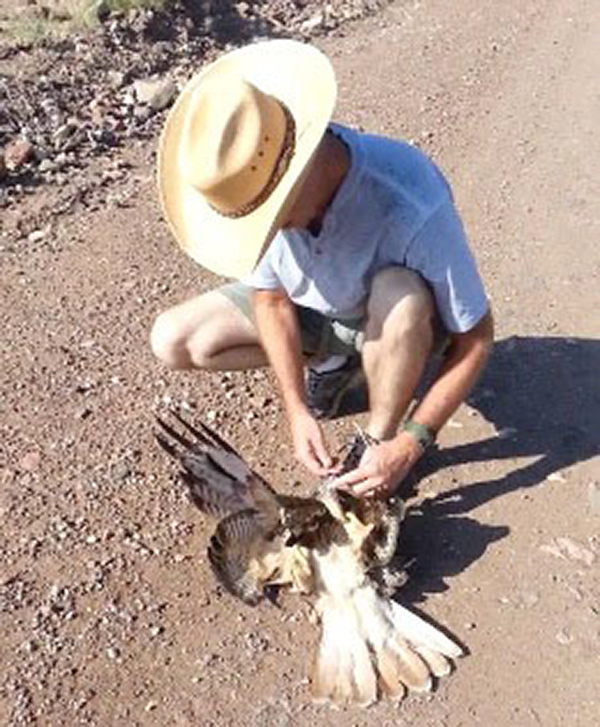 Seeing the man handle the hawk without any gloves is unnerving, although it looks like they came upon this tangle unexpectedly. I hope the young hawk remembers its hunting lesson. WOW!! what a great video. Thanks for sharing.